Parenting can be very stressful. Whether you’re a stay at home parent or a working parent, a single parent or a married parent, mother or father, parent of one child or several children — remaining cool, calm and full of energy can help get you through the day. 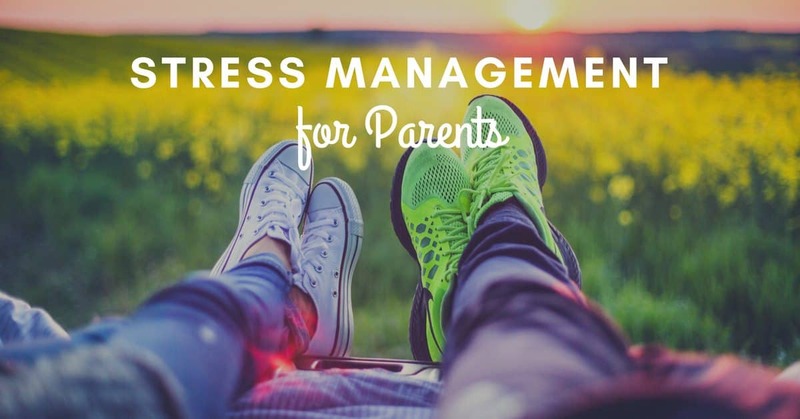 In this article, you will learn simple stress management tips and relaxation exercises that have proven useful to all adults. Taking a moment to consider which stress management tools will work for you and putting them into practice will help to provide the stress management approach you’re looking for and the stress relief you deserve. Chronic tension affects each of us differently. Depending on the person, it can cause sleep disturbance, increased or decreased appetite, headaches, stomach aches, poor concentration or irritability. Some diseases may be caused by or made worse by chronic tension. Also, our immune system can be weakened, thus making us more susceptible to colds and other infections. Following are some strategies to reduce tension and stress. The first section will help you learn three proven ways to relax: progressive relaxation, deep breathing, and pleasant images. The second section will provide you with 50 proven ways to reduce stress. Use of positive mental images can be useful. Many parents have benefited from listening to a relaxation MP3 such as Being a Happy Effective Parent . We will start with your feet and lower legs. Tighten those muscles as hard as you can. Feel the tension. Then gradually release the tension. Let your feet and lower leg muscles relax just a little bit at a time. Repeat this with your upper leg and hip muscles. Again, experience first the tension and then the gradual relaxation as you slowly release all of the tension. Next, tense the muscles in your hands and lower arms. Make a fist. Tighten them as tight as you can. Then gradually let them relax. With each muscle group, the relaxation feels good. As you relax one group at a time, your whole being will begin to feel relaxed, calm and peaceful. Repeat the tension and then gradual relaxation with your upper arms and shoulders. Remember to tense and hold before relaxing. Now tighten your stomach muscles. Hold the tension and then gradually release. Then, move to your chest muscles. Take a deep breath. Hold it while tensing your chest muscles. Slowly let out your breath while gradually letting go of the tension in your chest muscles. As you have now progressively relaxed most of your major muscle groups, you may feel a tingly sensation. You will find that your breathing has become slower and deeper. You are now relaxed. Try to practice this technique on a daily basis. When you have followed the above for about 10 to 15 sessions, try it without tensing the muscles. See if you can relax one muscle group at a time while breathing slowly and deeply. Relaxation and Stress Management Program – Imagery Relaxation and Success Rehearsal is a MP3 audio program that is great for general relaxation training. When we’re tense, our breathing is often shallow and rapid. Most of us do not breathe properly, tense or not. Improper breathing robs us of oxygen which purifies our body as well as helps our body produce energy. Fortunately, learning to breathe correctly is not difficult. Find a comfortable place to lie down. Place your hands on your abdomen just below your ribs. Begin breathing slowly and deeply. If you are breathing correctly, you will feel the expansion in the abdominal area before your rib cage expands. Spend 5 to 10 minutes several times a day practicing your deep breathing. You will notice that as you become more proficient, your breathing will improve during your normal activities. When we think about things that are upsetting, our body becomes tense. This is because the lower centers of our brain, which regulate body functions, does not distinguish between real and imagined images. If you think about being in an uncomfortable situation, your body will begin to respond as if you were in that situation. Since you’ve probably had lots of experience thinking about things that cause tension, you have all the skills necessary to do just the opposite. Imagine something that makes you feel good. To prepare for your mental vacation, relax your muscles and take a few deep breaths. Then close your eyes and imagine you’re someplace you enjoy. It could be the beach or the mountains or enjoying a favorite activity. Try to experience this imagined event fully. See the sights. Hear the sounds. Feel the air. Smell the smells. Tune in to the sense of well-being. At first, you should allow 10 to 15 minutes for this exercise. As you become more adept, you will find that you can feel like you have been on an extended vacation or have just returned from a good time in only a few moments. Listening to music is very relaxing. Reading can be rewarding for many. Enjoying a hobby can make life more fun. Research has shown that exercising several times a week (even just a walk) can reduce tension and stress. Research has also found that regular church attendance and daily prayer result in lower blood pressure and better coping skills. 4. Make duplicates of all keys. Bury a house key in a secret spot in the garden and carry a duplicate car key in your wallet, apart from your key ring. 6. Be prepared to wait. A good paperback can make a wait in a post office line almost pleasant. 7. Procrastination is stressful Whatever you want to do tomorrow, do today; whatever you want to do today, do it now. 8. Plan ahead. Don’t let the gas tank get below one-quarter full. Keep a well-stocked emergency shelf of home staples. Don’t wait until you’re down to your last bus token or postage stamp to buy more, etc. 9. Don’t put up with something that doesn’t work correctly. If your alarm clock, wallet, shoe laces, windshield wipers, or whatever are a constant aggravation, get them fixed or get new ones. 10. Allow 15 minutes of extra time to get to appointments. Plan to arrive at an airport one hour before domestic departures. 11. Eliminate (or restrict) the amount of caffeine in your diet. 13. Relax your standards. The world will not end if the grass doesn’t get mowed this weekend. 14. Pollyanna-Power! For every one thing that goes wrong, there are probably 10 or 50 or 100 blessings. Count ’em! 15. Ask questions. Taking a few moments to repeat back directions, what someone expects of you, etc., can save hours of time. 16. Say “No!” Saying “no” to extra projects, social activities, and invitations you know you don’t have the time or energy for takes practice, self-respect, and a belief that everyone, everyday, needs quiet time to relax and be alone. 17. Unplug your phone. Want to take a long bath, meditate, sleep, or read without interruption? Drum up the courage to temporarily disconnect. (The possibility of there being a terrible emergency in the next hour or so is almost nil). Or let calls go to voicemail. 18. Turn needs into preferences. Our basic physical needs translate into food, water, and keeping warm. Everything else is a preference. Don’t get attached to preferences. 20. Make friends with non-worriers. Nothing can get you into the habit or worrying faster than associating with chronic worrywarts. 21. Get up and stretch periodically if your job requires that you sit for extended periods. 22. Wear earplugs. If you need to find quiet at home, pop in some earplugs. 23. Get enough sleep. If necessary, use an alarm clock or the alarm setting on your phone to remind you to go to bed. 24. Create order out of chaos. Organize your home and work space so that you always know exactly where things are. Put things away where they belong and you won’t have to go through the stress of losing things. 25. When feeling stressed, most people tend to breathe in short, shallow breaths. When you breathe like this, stale air is not expelled, oxidation of the tissues is incomplete, and muscle tension frequently results. Check your breathing throughout the day as well as before, during and after high pressure situations. If you find your stomach muscles are knotted and your breathing is shallow, relax all of your muscles and take several deep, slow breaths. Note how, when you’re relaxed, both your abdomen and chest expand when you breathe. 26. Writing your thoughts and feelings down (in a journal, or on a piece of paper to be thrown away) can help you clarify things and give you a renewed perspective. 27. Try the following yoga technique whenever you feel the need to relax. Inhale deeply through your nose to the count of eight. Then with lips puckered, exhale very slowly through your mouth to the count of 15 or for as long as you can. Concentrate on the long sighing sound and feel the tension dissolve. Repeat 10 times. 28. Inoculate yourself against a feared event. For example, before speaking in public, take time to go over every part of the experience in your mind. Imagine what you’ll wear, what the audience will look like, how you will present your talk, what the questions will be and how you will answer them, etc. Visualize the experience the way you would have it be. You’ll likely find that when the time comes to make the actual presentation, it will be “old hat’ and much of your anxiety will have faded. 29. When the stress of having to get a job done gets in the way of getting the job done, diversion (a voluntary change in activity and/or environment) may be just what you need. 30. Talk it out. Discussing your problems with a trusted friend can help clear your mind of confusion so you can concentrate on problem solving. 31. One of the most obvious ways to avoid unnecessary stress is to select an environment (work, home, leisure) which is in line with your personal needs and desires. If you hate desk jobs, don’t accept a job which requires that you sit at a desk all day. If you hate to talk politics, don’t spend a lot of time with people who love to talk politics, etc. 32. Learn to live one day at a time. 33. Every day, do something you really enjoy. 34. Add an ounce of love to everything you do. 35. Take a hot bath or shower (or a cool one in the summertime) to relieve tension. 36. Do something for somebody else. For instance, make a meal for someone who is in need. 37. Focus on understanding rather than on being understood; on loving rather than on being loved. 38. Do something that will improve your appearance. Looking better can help you feel better. 39. Schedule a realistic day. Avoid the tendency to schedule back-to-back appointments. Allow time between appointments for a breathing spell. 40. Become more flexible. Some things are worth not doing perfectly and some issues are well to compromise upon. 41. Eliminate destructive self-talk; “I’m too old to…,” “I’m too fat to…,” etc. 42. Use your weekend time for a change of pace. If your work week is slow and patterned, make sure there is action and time for spontaneity built into your weekends. If your work week is fast-paced and full of people and deadlines, seek peace and solitude during your days off. Feel as if you’re not accomplishing anything at work? Tackle a job on the weekend, which you can finish to your satisfaction. 43. “Worry about the pennies and the dollars will take of themselves.” That’s another way of saying: take care of the todays as best you can and the yesterdays and the tomorrows will take care of themselves. 44. Do one thing at a time. When you are with someone, be with that person and with no one or anything else. When you are busy with a project, concentrate on doing that project and forget about everything else you have to do. 45. Allow yourself time everyday for privacy, quiet, and introspection. 46. If an especially unpleasant task faces you, do it early in the day and get it over with. Then, the rest of your day will be free of anxiety. 47. Learn to delegate responsibility to capable others. 48. Don’t forget to take a lunch break. Try to get away from your desk or work area in body and mind, even if it’s just for 15 or 20 minutes. 49. Forget about counting to 10. Count to 1,000 before doing something or saying anything that could make matters worse. 50. Have an optimistic view of the world. Believe that most people are doing the best they can.